Several of Mrs. Malisham's 5th grade teachers as well as her band director use me a preferred substitute teacher. She has encouraged me to include her a reference for teaching jobs. Mrs. Davis is the principal at Weaver Elementary School. She indicated to me that she was very pleased with my performance as a substitute teacher at her school and offered to be a reference for me. Jamie was my cooperating teacher at Piedmont Middle School and Piedmont High School. I have also substitute taught for him in the past. He has been able to see my teaching and organizational abilities first hand as well as over an extended period of time. Dr. Baptiste was my graduate school advisor at Jacksonville State. She was able to see my teaching abilities with younger students during lab placements at JSU. She also advised me as I completed a thesis option for graduation from JSU. She has helped me put together a poster presentation to present at the Alabama Music Educators' Conference . Dr. Logsdon was a professor and advisor of mine at Jacksonville State. He and I are also involved in our church's music program together. He was able to observe my teaching abilities during my student teaching as well as my musical abilities at church. Dr. Montgomery taught a curriculum planning class I took in graduate school. Through her class I got to know her and have kept in touch with her over the last few years discussing education politics and administrative practices. Ms. Zeanah is the principal at Elberta Elementary School and a long-time friend of my family. I have been a substitute at her school on several occasions. She offered to be a reference for me after observing me substituting for some of her teachers. Jeff has been a mentor to me since 2008 and has allowed me to work with his students while in graduate school, as well as seeing my teaching abilities first hand. While at Jacksonville State University, I completed a thesis entitled A Pilot Study: The Assessment Procedures of Instrumental Music Teachers in Northeast Alabama that focused on examining the assessment practices of instrumental music teachers and their perceived effectiveness. While here I was a member of the Sound of the South Marching Band, Collegiate Singers, and Phi Mu Alpha Sinfonia. I was member of the music ministry at Hephzibah Baptist Church and occasionally attended the Baptist Campus Ministries when time allowed. I was the band director and music teacher at Ernest F. Bush K-8 School from Nov. 2014-2015, the band director at Carrie A. Tuggle Elementary School from Aug. 2015-May 2016, and the assistant band director at Arthur Harold Parker High School from Aug. 2015-May 2016. While in Birmingham City Schools, I was the textbook coordinator at Bush and Tuggle. I was also responsible for school multimedia and audio equipment. I was also responsible for safety drills at Tuggle and making sure the school was compliant with nSide and VAS3. As the assistant at Parker, I helped the band achieve the highest scores in school history at state music performance assessment. I worked with various Baldwin County schools (mainly Elberta Elementary School, Foley Elementary School, Foley Intermediate School, and Swift School.) as a substitute teacher. My primary job was to continue the learning process while a teacher was absent and to maintain classroom order and discipline. I developed professional and personal contacts with the faculty and staff of the schools. Many faculty members praised me on my professionalism as well my ability to the class on track for the absent teacher. I worked with the Anniston City Schools (primarily at Anniston High School) as a substitute teacher. My primary job was to continue the learning process while a teacher was absent and to maintain classroom order and discipline. I developed professional and personal contacts with the faculty and staff of the schools. Many faculty members praised me on my professionalism as well my ability to the class on track for the absent teacher. I worked with the Oxford City Schools (primarily for DeArmanville Elementary and Coldwater Elementary) as a substitute teacher. My primary job was to continue the learning process while a teacher was absent and to maintain classroom order and discipline. I developed professional and personal contacts with the faculty and staff of the schools. Many faculty members praised me on my professionalism as well my ability to the class on track for the absent teacher. I worked with various Calhoun County schools (mainly Alexandria Elementary, Alexandria High School, and White Plains High School) as a substitute teacher. My primary job was to continue the learning process while a teacher was absent and to maintain classroom order and discipline. I developed professional and personal contacts with the faculty and staff of the schools. Many faculty members praised me on my professionalism as well my ability to the class on track for the absent teacher. I worked with the Jacksonville City Schools as a substitute teacher. My primary job was to continue the learning process while a teacher was absent and to maintain classroom order and discipline. I developed professional and personal contacts with the faculty and staff of the schools. Many faculty members praised me on my professionalism as well my ability to the class on track for the absent teacher. I worked with the Piedmont City Schools (mainly Piedmont Middle School) as a substitute teacher. My primary job was to continue the learning process while a teacher was absent and to maintain classroom order and discipline. I developed professional and personal contacts with the faculty and staff of the schools. Many faculty members praised me on my professionalism as well my ability to the class on track for the absent teacher. I taught beginning band to fifth graders, intermediate band to sixth graders, marching band 6-12, concert band 7-12, music appreciation, and 8th grade music elective. While at Ider, I was able to help raise the average playing level of the band as well as helped to implement inventory tracking systems, music cataloging, and build school and community support for the program. I taught beginning band to sixth graders, intermediate band to seventh graders, marching band 8-12, concert band 8-12, music appreciation, and beginning guitar. While at Thomasville, I was able to begin building newfound community support for the band program as well as help raise the average playing level of the band. I was also responsible for reinstating the majorette line which had been disbanded about 10+ years before my arrival. 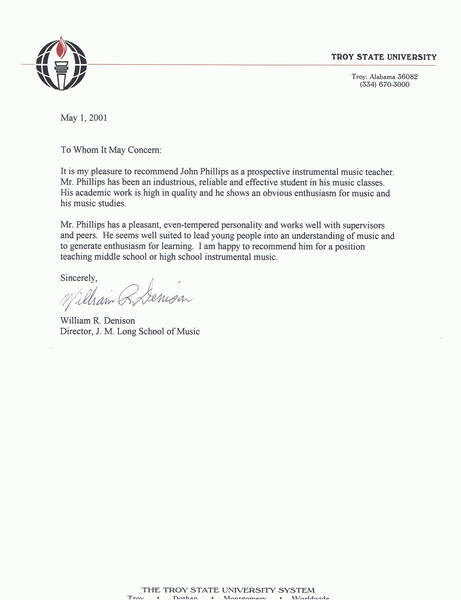 I taught sixth grade beginning band, seventh grade intermediate band, eighth grade advanced band, and 7-8 music appreciation. 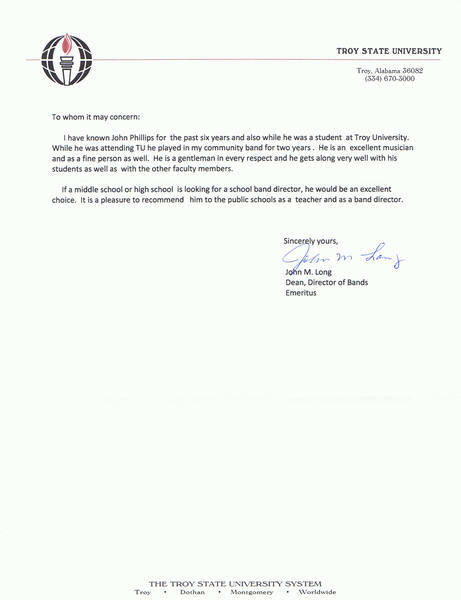 I assisted the high school director during marching season in whatever capacity was needed. While at Greenville, I was able to rebuild an organizational structure into the facility that had not existed in a couple of years as well as reorganize and re-catalog the music library. I do basic repairs on musical instruments to get them in playing condition or can diagnose basic problems to explain to a repair technician. I can usually give a rough cost estimate as well. I can set up and operate a sound system, run and do basic trouble shooting on computers, set-up computers and computer components and accessories with minimal guidance. I have written drill for my groups in the past, but I've not learned a computer program yet. I design by hand. I arrange tunes for my ensembles, usually warm-ups and chorales. Other tunes take longer to do, but I have done them in the past. I take pictures of various scenes and people. I need an equipment upgrade, but I do well with the setup I have. I have dabbled in creating websites for myself and my previous bands. I do have to get help from some friends on occasion, but I try to always put together a logical, visually pleasing product. Certificates, Recommendation Letters, Work Samples, Etc. Various certificates, recommendation letters, work samples, and other pertinent documents. Performing with concert and marching bands, singing, photography, writing, web design, audio recording, music arranging, marching band drill design, technology/computers, and drama/musical theater, health and fitness, church and church related activities. IN PROGRESS- Component 2 passed, Components 1 & 3 pending. Component 4 not released.